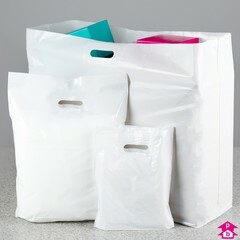 A great range of clear, white and black plastic carrier bags for a timelessly stylish look. The range includes patch handle carriers (which have a reinforced handle to give extra bag strength) and flexiloop carriers which have reinforced handles made from thick polythene welded to the inside of the bag to make carrying heavier items comfortable. 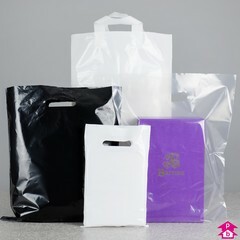 (NB: for patch handle carriers printed with your logo or design, please see our printed carrier bags service). 2 Products. 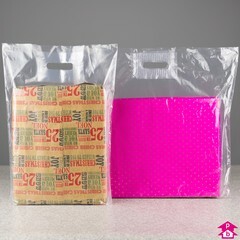 This kind of shopping bag never goes out of fashion and is a great way to showcase your products too! These transparent carriers also have a reinforced patch handle that gives extra bag strength and a more substantial feel. 9 Products. These classic carrier bags are made from crisp white polythene and feature a reinforced patch handle for extra bag strength and a more substantial feel. A firm favourite with stylish retailers everywhere, this type of bag is also used for our printed carriers service. With a free quote in just 60 seconds and a minimum order of just 1,000 bags, printing your company logo or design on your bag has never been easier! 5 Products. A smart new range of white flexiloops. 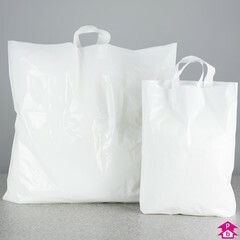 Flexiloop plastic carrier bags have reinforced handles made from thick polythene that are welded to the inside of the bag. Because the handles extend outside the carrier the entire volume of the bag can be filled. The strong handle is also comfortable to hold when carrying heavy items and larger loads. 4 Products. A range of sleek extra-strong black carrier bags that are twice the thickness of a standard carrier, giving a more substantial feel as well as overall strength. The reinforced handles (patch-handles) support the bag's ability to carry more without the risk of collapsing handles.